Neil Diamond had recorded an album called ‘Songs From The Brill Building’. 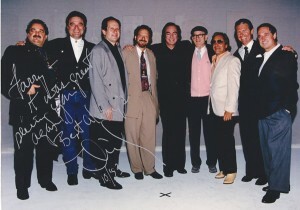 One of them, was a song that ten of us had written when starting out on Broadway years before, called ‘Ten Lonely Guys’. It was written one night in the offices of Roosevelt Music Inc. as a morale booster for all the writers that were up there that evening. Our inspiration included a bottle of ‘Jack’ and was organized by the late Stanley Kahn and Wes Farrel. The song came out so good, that we recorded a record calling ourselves the ‘Ten Lonely Guys’, which was later covered by Pat Boone who took it to the 20′s on the charts. In this picture, excluding Neil Sedaka, were the ‘ten lonely guys’ excluding Lockie Edwards Jr. who could not make the album release event we all attended that night. But the collection of writers who stood there, were responsible for many song standards that sprung from working in those nondescript writing rooms on Tin Pan Alley’s Brill Building and 1650 Broadway. Thanks for sharing, I found this story while googling for lyrics, interesting comments and great points made.